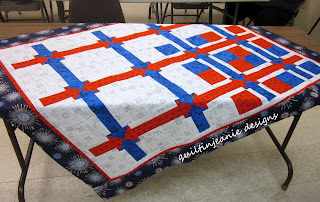 I'm excited to tell you about a new event on my blog, the Red, White and True Quilt Along. I've wanted to do a quilt along for a long time, but time flies by so quickly during the school year that it just hasn't happened. Summer gives me a bit more free time plus time to play! 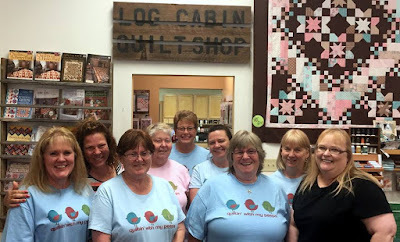 So get ready to quilt a long with me! 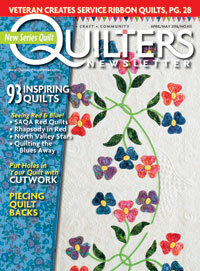 You can work on this quilt week by week and have something beautiful at the end. If you are not into patriotic prints, you can make the quilt out of any other fabrics that catch your eye! First off, some Guidelines for the Red, White and True Quilt Along. The guidelines will be accessible through the location bar at the top of the page. 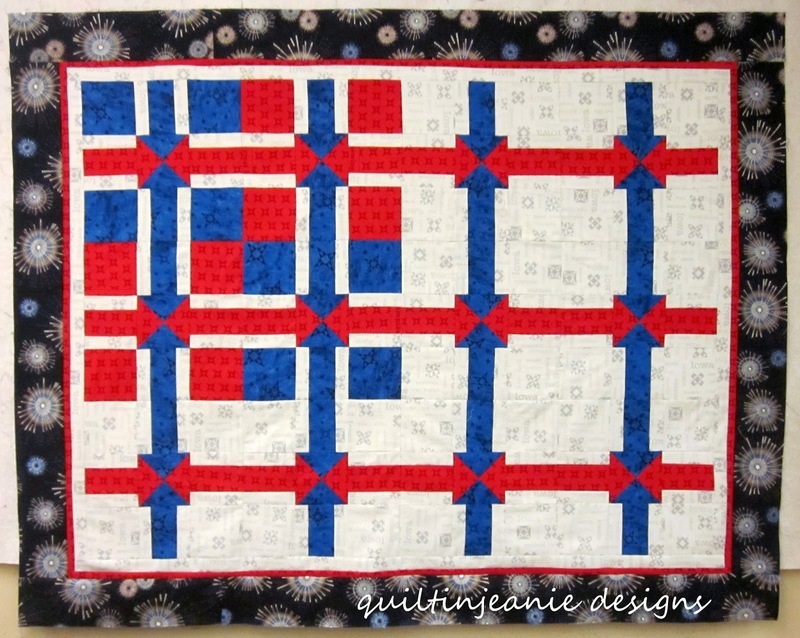 Make the Red, White and True quilt using the weekly tutorials. The free patterns will also be available every week on Craftsy so you can print it out easily. Quilt can be made using any fabrics. It doesn't have to be red, white and blue to participate. The pattern will be available in two sizes. Add or subtract blocks, you can make it any size you want! 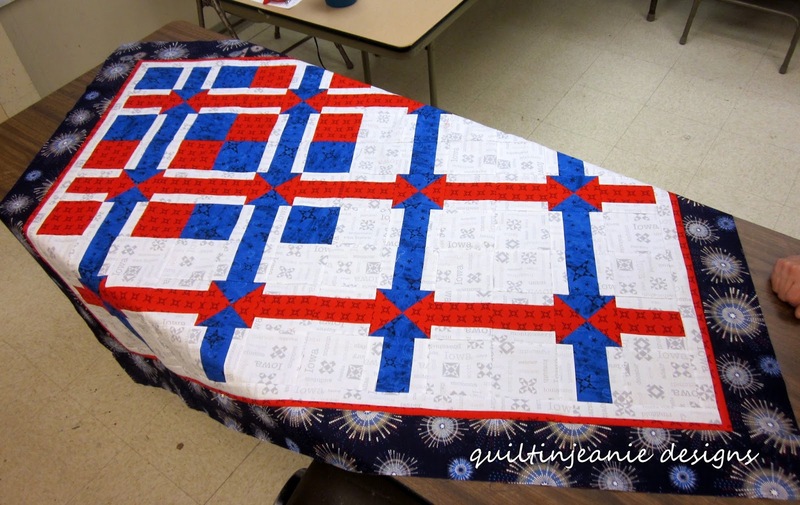 Join the Flickr group, Quiltinjeanie Designs Red White and True Quilt Along and post pictures as you go! 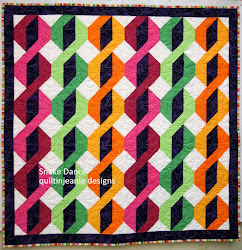 Join the weekly Link Party to share your experience making this modern, graphic quilt. Have fun! Let's get started! 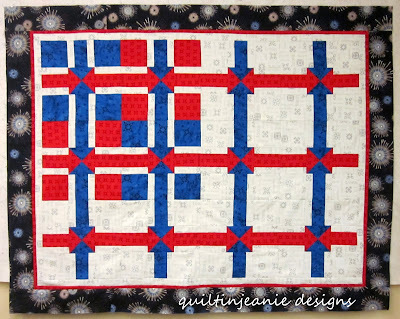 You can definitely use stash fabrics...using several red, blue and white prints instead of one per color. I've listed the fabric requirements below so you can be ready to start cutting on Monday, June 22, 2015. Start looking through your fabrics for just the right ones for this project! Once you've found them, feel free to post pictures in my Flickr group, the link is above. Or let me know and I can post them for you. Throw 46”x 58 Twin 64" x 88"
Background: 1 ½ yd. 2 ¾ yd. Color 1 Red: 1 yd. 1 ⅝ yd. Color 2 Blue: ¾ yd. 1 ¼ yd. 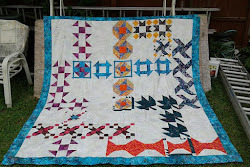 Final Border: 1 ¼ yd. 1 ¾ yd. My inspiration for this quilt was originally the IA shop hop fabrics, but I already have plans to make another quilt using this pattern and non-patriotic fabrics. So I plan to sew with you to make that version. This is really a great idea should be lots of fun. Sounds like a fun idea and I'm sure that you'll have many people joining in.